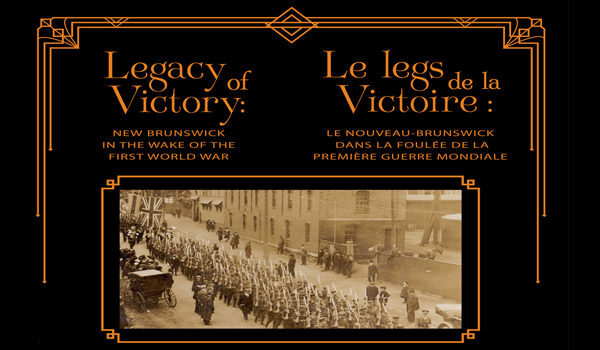 2 November 2018 to 14 April 2019: To commemorate the 100th anniversary of the end of the First World War, the New Brunswick Museum is presenting a new exhibition, Legacy of Victory. Legacy of Victory: New Brunswick in the Wake of the First World War looks beyond the battleground to explore what happened once the war was won. This new exhibition speaks to the days immediately after the 11th of November 1918 and explores how society changed in the next few years until “The Crash” in October 1929. The First World War’s legacy was the rapid emergence of modernity and visitors will see that one world ended and a new one began. They will also discover what happened at the moment of the Armistice. Canada quickly organized the demobilization of soldiers and their return. For the veterans, though, there were a host of challenges. Most made the adjustment: securing employment and moving on, but others with shellshock, missing limbs and recurring nightmares had trouble reintegrating into family life and were never really the same. Society was in mourning for those who had fallen in battle and did not return. At the same time, another enemy arrived – the first global pandemic, Spanish influenza – that took most by surprise. This additional loss of many Canadians also had a pronounced social and economic impact on a country that had already suffered 60,000 war fatalities. Yet this dark period also saw a new spirit of modernity emerge. Canadian identity grew as never before. The population wanted change and there were some dramatic developments, including women’s right to vote. Some war industries turned their attention to fulfilling the needs of new consumers and bringing modern conveniences and affordable mass-produced goods. Some technologies, tested by war, were soon adapted to daily lives: aviation, railways and automobiles transformed transportation and with the changes brought by a rapidly expanding electrical grid, communication through telephone and radio was widespread. This era also changed how we saw ourselves and how we showed ourselves to others. The arts experimented with new ways of expression and the tourism industry promoted New Brunswick as never before. Consumer society flourished with the desire for all things new: the home and its interior were reconsidered, new fashions were widely advertised and available and an emphasis on a youthful, healthy lifestyle was encouraged through sports and recreation even though prohibition persisted until 1927. The decade that we know as the “Roaring Twenties” still influences the way we live today. The victory after the First World War gave rise to an urgent eagerness to live life to the fullest but it also provided clues to the events that darkened the near future when the party would end.